There are days I miss my city more than others. I miss my family, my cats, my friends, my house, my car. I miss the breeze that carries the ancient history, the sight of ruins and deteriorations, the walks among the old that still rule over the new. I miss the museums, the live theatres, the stores, the cafés. I miss the sound of my native tongue. I even miss things that I would have never thought I’d missed: my job, the crazy traffic, the noise, the chaos, the disorganization, the crowded subway. I know it is just a cloud in the sky. It will pass. It is in one of those days that I bake Bread. We love bread, especially rustic, crusty breads, italian style. Every meal in an italian household has bread on the table, home made or store bought (nowadays, store bought wins by far). I found this recipe for a gluten-free bread on “Honey & Oats” by Jennifer Katzinger and since I had some spelt flour left, no bread in the house and a melancholy day, I thought it a good idea. Baking bread is always a good idea for me, anyway. It relaxes me and soothes me. In this No-Rise Rustic Spelt Bread the dough does not need to rise, it does not contain yeast but baking soda, thus it is a “quick” bread. After kneading it gently and shortly, I had to pat it down to a 6-inch diameter. 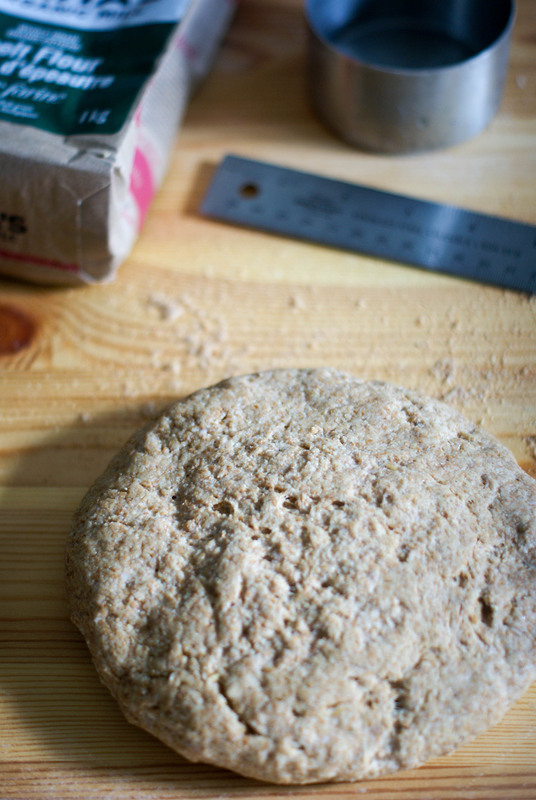 If you were wondering why a ruler was on the wood board, close to the dough, well, I don’t know anything about inches, but fortunately in the house we had an inch/cm ruler and I used it to measure the diameter of the dough 😉 . The bread cooking in the oven smells wonderful and my mood has already improved. When it is time to take it out of the oven, I let it cool on a rack and wait the strictly necessary time so not to burn my fingers and tongue before being able to slice it and taste it. 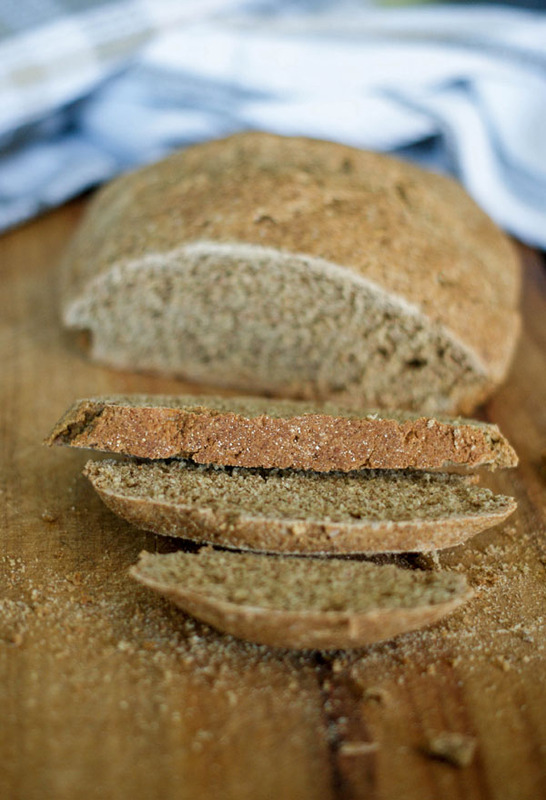 The crust of this no-rise rustic bread is crunchy, the inside soft and pillowy. The spelt flour and maple syrup give a delightful taste, nutty with just a hint of sweet. It is as good eaten like that as toasted. Perfect for breakfast, but also as a complement to lunches and suppers. The morning after, my husband made a tuna sandwich for me as a packed lunch for work. He toasted two slices of the spelt bread before spreading his always amazing tuna concoction and I can tell you it was the best tuna sandwich I ever had. My husband: my best friend, lover, partner, teacher, mentor, support. My perfect other half of the apple. He is the reason why I am here, the absolute reason. The reason that wipes out all my cloudy days. From a recipe found on “Honey & Oats” by Jennifer Katzinger. Pre heat the oven to 375° F and lightly flour a baking sheet. In a large bowl, combine the flour, salt,and baking soda. In a small bowl, combine the maple syrup, oil and water. MIx the wet ingredients into the dry just until a smooth dough forms. On a lightly floured work surface, gently knead the bread to shape, about 3 minutes, and then form it into a 6-inch diameter round loaf. Place it on the prepared baking sheet. Using a sharp knife, score it in a semicircle. Bake until Golden brown and firm to the touch, about 50 minutes. Let bread cool for 45 minutes before serving or cutting. It is a lovely rustic “quick” bread that rises with baking soda and does not require a long process. Sounds like a very easy bread recipe! No yeast required! 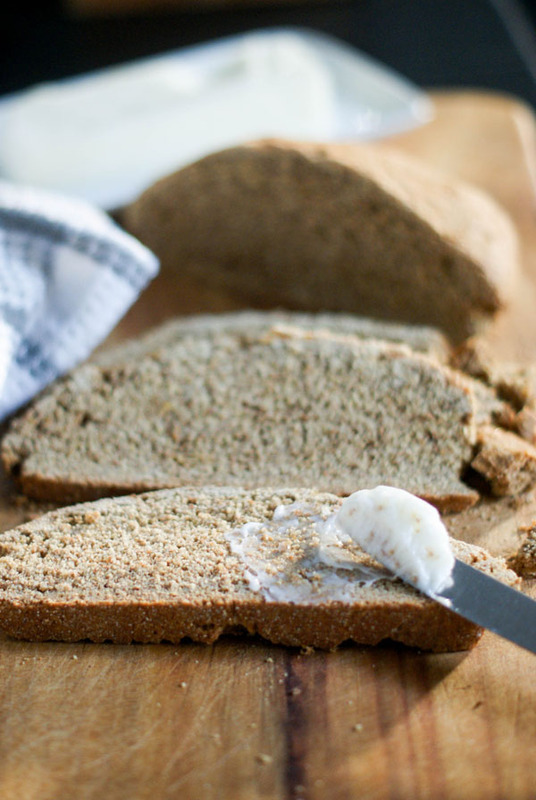 It is quick and easy, and also crusty rustic good! Thank you so much for this wonderful and easy recipe. I was blown away by the taste and texture. I did use agave instead of the maple syrup, and it was still delicious. I have been trying out different alkaline bread recipes and yours is the very BEST-thanks again! How nice to read such a lovely comment! Thank you so much for your feedback, I am happy when I can help! Next time I make it, I’ll try using agave, many of you, now, used agave instead of maple syrup with great results. Hi 🙂 Is it possible to make it without maple sirup? Thanx! Hi Liv! I haven’t tried it without the maple syrup, because it adds a wet element and a lovely sweet counterpart to the savory bread. Maybe add a little more water or oil if you feel it’s too dry when you’re kneading it. I made this recipe this morning. I love how quick this bread is. I’m used to making 18-hour no knead breads which require much more advance planning! Your recipe tasted a little bit more like cake than bread but I guess maybe that’s what a quick bread is. Thank you for posting the recipe. I’ll probably make yeasted breads from now on (just my personal preference) but it’s good to know I have options! Thank you so much, Monica, for trying the recipe and leaving your feedback. Yes, I know, it is a bit different than yeasted breads, but I wouldn’t say it tastes like cake, considering how crusty it is. Thank you for your feedback, Valentina! Honey is a great alternative, I use that too. 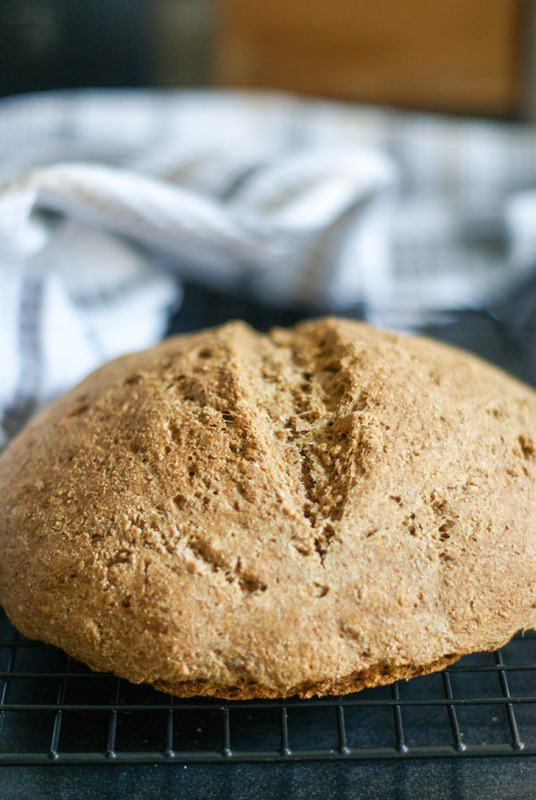 Can you use White spelt flour? I am so happy to hear that! You’re very welcome. Thank you so much for leaving your feed back. This is the best part of sharing recipes 🙂 . My other half has a yeast intolerance but LOVES bread so I’ve given this a go as I struggle to find yeast free bread in supermarkets. The loaf is in the oven as we speak and it was so quick and easy to prepare! Thank you so much! Yes, it is easy to make, and great for anybody with yeast intolerance. So happy I could be of any help. Hope you both love it 🙂 . This was my first time making bread (I am a terrible cook) and I couldn’t be more pleased. The taste is delicious and the texture is just wonderful. I have a sensitivity to olive oil and some other food sensitivities, so I used coconut oil and tapioca dextrose. It came out amazing. I also used the same recipe to make muffins and added in some extra sugar and baked them for about 20 minutes less and they were perfect. Thank you so much for sharing! So so happy you liked this quick bread! Thank you for the feedback. What a great idea to make muffins! I haven’t tried, but I would imagine it would work. There’s only one way to find out… 🙂 . Hello! I made your recipe with spelt flour and it came out just fine. I have some organic white flour I bought today and I’m thinking of using the same recipe with the white. Any thoughts on this? Wondering if it will turn out with the same consistency, i. E. Crusty on the outside and soft on the inside. Hi! Thank you for your feedback. I haven’t tried, but I would say yes. Probably less dense, softer, inside, and I would imagine with a nice crust. Please, let us know how it goes! Thank you for this. My attempt came out really nice, although it did not look like your beautiful photos, it was more bumpy looking. I used rice malt syrup instead of honey & macadamia oil instead of olive oil. I’m not a great baker or cook, but I found the batter/to be extremely sticky. Is this normally the case? Also, what is the 1 tablespoon of water used for? Hi! Glad to hear it came out nice even though a little bumpy looking 🙂 . Mine is not as smooth as well, but it wasn’t particularly sticky. I have never used macadamia oil, I don’t know if the consistency is similar to olive oil, and never used malt syrup, but somebody left in the comment that they used tapioca dextrose (which I don’t use either) and said it came out amazing. The 1 Tbsp water is just to add to 1 cup, it is 1 cup and 1 Tbsp. Hope that helps. Thank you for your feedback! I tried again, this time using maple syrup which gave it a really nice flavour. I think my first time was with wholemeal spelt flour which make it stickier, this time I used mostly normal spelt flour, with a little of the wholemeal I had left over (about 1 cup). I found it was a little less sticky. I also still used macadamia oil instead of olive oil. End result was really nice. Next time I will use exactly the ingredients you list. Possibly, third time will be a charm. Thank you again for this simple recipe. Thanks for the feedback! Yes, I think that’s what it was to make it sticky, the wholemeal spelt. I really like the maple syrup flavor in this bread 🙂 . Thank you so much, Traci, for the feedback! I love baking, and I really love this bread. Glad you loved it too! Just made this for the first time and I think it turned out ok! I like the flavor of it with a little butter. Giving your photos another glance, I’ll definitely give this recipe a few more tries to see how shape affects the bake. So happy to hear it turned out ok! It is just a nice bread to have around when you can’t have the “real deal” with yeast. Next time try to make it 6-inch diameter and see how it goes. Thank you so much for your feedback! This looks absolutely wonderful Nicoletta. I can’t believe there’s no yeast in there! I don’t often work with spelt flour so I was wondering if the recipe works well with all-purpose white or whole wheat flour? It’s definitely a must try for me, thanks for sharing! Hi Nadia, thank you! It is really a lovely rustic bread. I have never done it with only all-purpose flour, but this morning I had to add some to the spelt flour because it wasn’t enough. You can try, and I think also the whole wheat would work really well. Can this be baked in a bread pan? I’m thinking probably not, but you can try and see how it goes. It doesn’t have the yeast to help it rise tall as a loaf pan. This is the 2nd bread I’ve made. 1st one went south. Different recipe completely. But baking bread is kind of becoming a little thing my girlfriend & i do now, and we just made it. Haven’t even tasted it yet, but so far, so good! I love the simplicity of the recipe and how quick it is. I was wondering if you had any ideas about what other kinds of flours to use without using any extra ingredients such as gluten or anything more than what is in the flour itself already.. well maybe an egg at most? Like rye, amaranth, garbanzo, kamut, einkorn, sorghum, chia, buckwheat, or any other flour that is healthier than the regular stuff?? Thanks! Sorry for the delay in the answer, I had completely missed the comment! 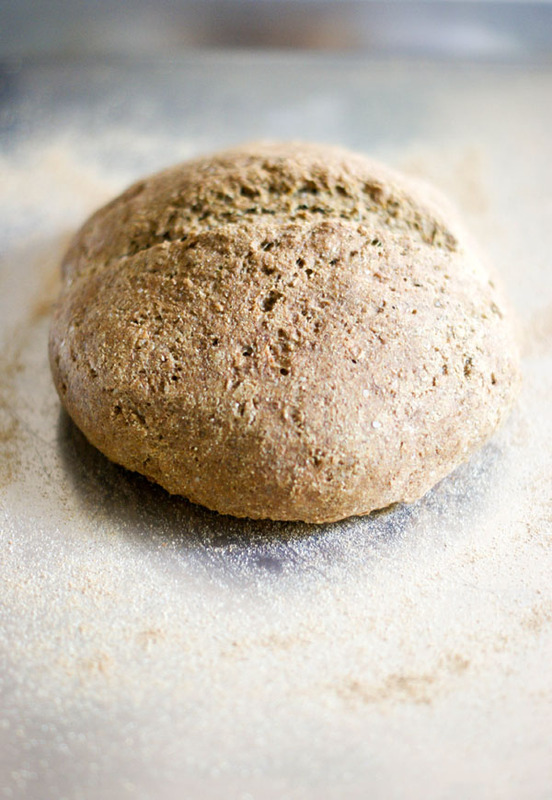 I haven’t tried baking this bread with any other flour, but I like the idea of rye, which I have and love. I wouldn’t put any egg, though. If you try a different g.f. flour, let me know. Thank you! Thanks for this. Currently in Italy and trying to avoid yeast. Italians don’t seem to use baking powder like in Ireland so went for your recipe! It was pretty dense down to the fact I used whole meal spelt flour but not bad at all. I prefer using a mix of white and spelt and it to be lighter (from baking soda and baking powder). Thank you though! I am currently back in Italy, too 🙂 . Thanks for the feedback. Yes, the whole meal spelt is pretty dense, try mixing it or using a white spelt. That’s what I usually use. I like the flavor and texture of this bread! This bread came out beautifully and tasted excellent. It is also in accordance with “The Eczema Diet” which is especially delightful. It was incredibly moist and flavorful. It was also very light! I used rice bran oil instead of olive oil. Your feedback made me happy! I love the flavor and texture of this bread, glad you liked it,too. Thank you! Could this be made low sodium? Looks great! Thanks for any help! You can eliminate the salt totally, the only thing, it will be a sweet “bread”. For a quick bread, that’s for sandwiches, it is excellent! I was reluctant to make it because I bake by grams (it’s precise & on the mark). So I wung it. I chose 385 g. of Organic Sprouted Spelt and followed all of the other measurements. It was a sticky dough, which I wanted, because it makes for a lighter bread. I got a nice crumb; it was still a little dense but NO brick for sure. It was tender with a nice crust too. It was a funny shape but who cares, it’s original. 😀 I took pictures not realizing there’s no place to upload pictures. Thanks for the recipe! BTW, I baked my bread @400 F for 40 min. because high heat helps the rise (oven spring). I bake my yeasted bread @500 for 10 min. and reduce to 450 for another 20 min. I may try the same with this bread next time. Thank you so much for giving this bread a try and for the feedback. Really appreciated! I would have loved to see pictures! I like the crumb of this bread and the crust. Glad it turned out adjusting the measurement to grams. I find sandwiches taste delicious with it. I will try your oven temperature suggestions next time I bake it too!